To donate to us, go here: https://goto.gg/30570 Donations made on that webpage will go to getting and mailing winter clothes, blankets, and our guide to US life to Darfuri refugees in the US. As of this writing, seventy donors have given us $3,116, if you count our $36 bonus from matching day and the $25 check being mailed to Global Giving for deposit in our fundraising account. Many Darfuris –especially members– have donated to us, proving once again how ready they are to support others in their community. We also would like to thank the non-Sudanese donors, and the anonymous donors, for their vital support. And special thanks must go to all of the fifty-one people, members or otherwise, who donated a total of $1,980 to us from November 28 to December 1! The Board has planned a video to post on our Facebook page, as well as another conference call with members over the weekend. If we can raise the $1,884 we need to make $5,000 by December 31, Global Giving will let us post as many projects as we like with no time limit. If we do not reach the $5,000 total by the end of the year, we will still receive all of the money we accumulated, and we will be allowed to try and raise money for another project, for a limited time, in March. 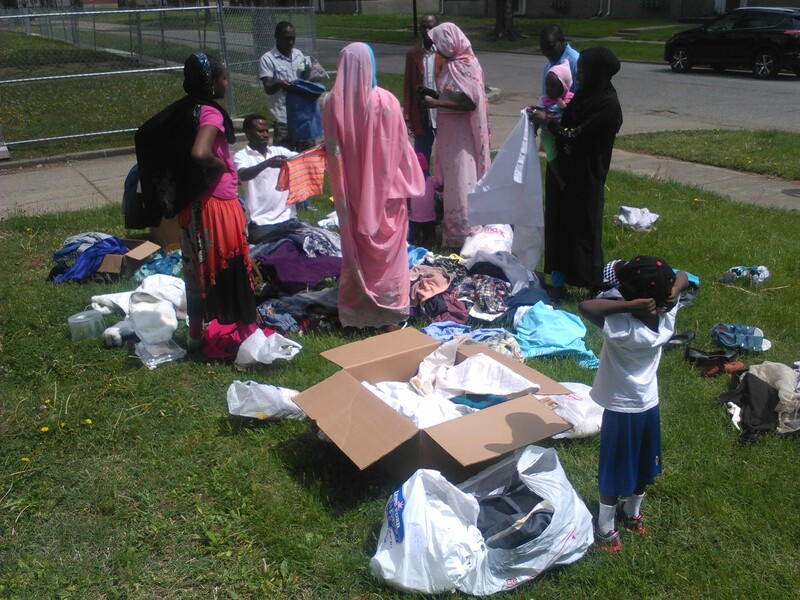 DOHS distributed clothes free of charge to numerous refugee families in Louisville on April 23, 2016.